ResourceEditor is a standalone application that consists of several modules including a tool for viewing and checking exported meshes and utilities for texture generation. These modules can be switched between using tabs at the top of the ResourceEditor window. ResourceEditor runs only in the OpenGL mode on all supported platforms. In order to speed up ResourceEditor on NVIDIA's G80 on Windows you need to select the Single display performance mode at the NVIDIA's control panel. If you have multiple monitors, you need to add ResourceEditor to the Program Settings tab of the panel and select the Single display option for it. ResourceEditor basic and camera-related settings can be adjusted by clicking Settings button in the upper right corner of the window. Low values (from the minimum angle of 1 degree) are for a narrow angle of view. High values (up to the maximum angle of 179 degrees) are for a wide angle of view (fish-eye view). Min Velocity — the velocity of normal camera motion, in units per second. Max Velocity — the velocity of accelerated camera motion (with pressed SHIFT), in units per second. Acceleration — the rate of changing from a normal to accelerated camera motion, in units per second squared. Damping — the rate of decreasing of the camera velocity till it stops completely. By the value of 0 the camera will move endlessly. Background — the background color. Wireframe — the color of the wireframe of the selected surface. Ambient — the ambient color. Light — the source light color. Left mouse button — go round. Middle mouse button — track. Right mouse button / scrolling wheel — come near/further. ALT+1 — switch to MeshViewer. ALT+3 — switch to NormalMapper. 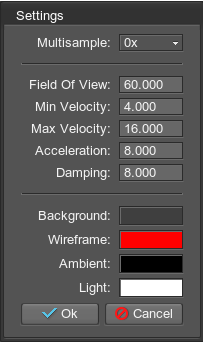 ALT+4 — switch to AmbientMapper. ALT+5 — switch to AlphaMapper. F1 — show module-dependent help.